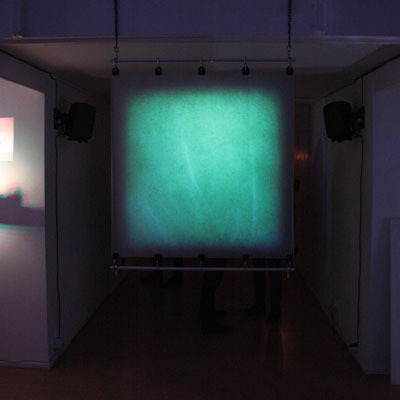 'fluid variations' is a meditative audiovisual environment. Indeterminate in is very nature, the structure of the piece is a terrain of possibilities, and as such has no beginning, end, or in the traditional sense progression. Its temporal arrangement is rather referential to the perception of time as a stream of continual moments, each moment containing the ability of transient contraction and expansion. The fluctuating textures, comprising image and sound, stand in a dualistic correlation of co-existing harmony. Multilayered strands of visual and acoustic transformation exist in momentary autonomy, and are synchronised only in their corresponding behavioural pattern over time. The swelling and receding continuous flow of the work is emergent in its audiovisual texture, as well as its progression. All aspects of the work are governed by the behaviour and continuous reiterating interactions of its individual elements. A simple arc maps the trajectory of an internally symmetric slow pulse across the dominant fluctuations in brightness and volume, as well as the altogether more subtle alterations in timbre and focus. These layers of slow and independently changing rhythms and intensities display synchronicity in their form and structure across the durational fluidity of the piece. As simultaneous chains of events however they only have the ability to influence each other's future trajectory. 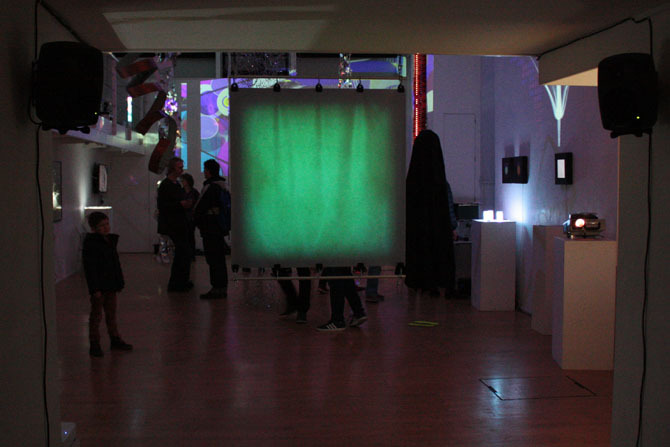 The organic morphing of the audiovisual drone is constructed on the basis of complete equality. The system and structure controlling the generative progression is thus based on the natural phenomena of super-organisms such as swarms of birds. In formations of this kind each member of the swarm acts independently. They however interact with every other member of the group through direct or indirect contact at any point in time. The resulting complex and ever-changing constellations in the sky are used as a model of controls for all image and sound parameters in 'fluid variations'. The relationship between the stimulus to the separate perceiving senses of sound and vision thereby holds no greater emphasis then the relationship of either of the subsections within the visible and audible parameters. The slowly developing impermanence across the acoustic spectrum of the work inhabits a microtonal scale in just intonation tuning. It is constructed around three intervals taken from the harmonic series, the 39th, 41st and 49th overtone. These aesthetic yet unusual intervals form the basis of the tonality, and embody a synesthetic representation of the image's colour. Occupying the lower register of the frequency arrangement, each played note is additionally manipulated by artificially enhancing one of the first 16 prevalent overtones. These altogether more familiar intervals, contained within the first four octaves of the harmonic series, facilitate further modification within the timbre of each played note. Seamlessly extending the sonic texture of the work into the upper frequency register of human hearing, their shifting movements furthermore signify a correlation to the flaming arteries contained within the visual display. 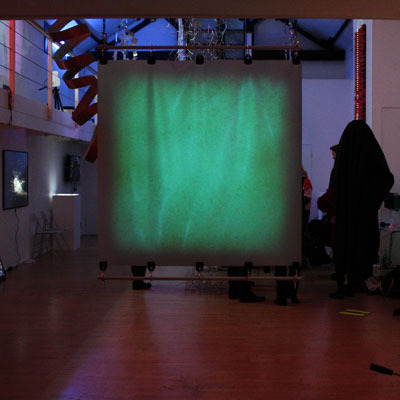 Installed at 'In the Dark' The London Group and Friend (back projection screen 92 x 92 cm, with aluminium poles and steel and plastic fixings), The Cello Factory, London, UK, 2019.